One of my most favorite things to do during this time of year is give. Whether it’s making extra donations to the food bank, picking an extra gift up for a needy child, or making tons of fun homemade goodies to pass out to friends and families. Giving a little extra at this time makes my heart warm and happy. So when my son came to me and asked if he could give a gift to everyone at his preschool my heart kinda skipped a beat. My little one loves giving just as much as I do! But our budget did not include the additional 12 robots he wanted to purchase for each of his classmates but making holiday ornaments was! We went a little more frugal and crafty this year and painted ornaments for each of the children to bring home. I dropped off a few boxes of the ornaments we painted at his preschool with instructions to have the kids put their thumb print on the ornament. 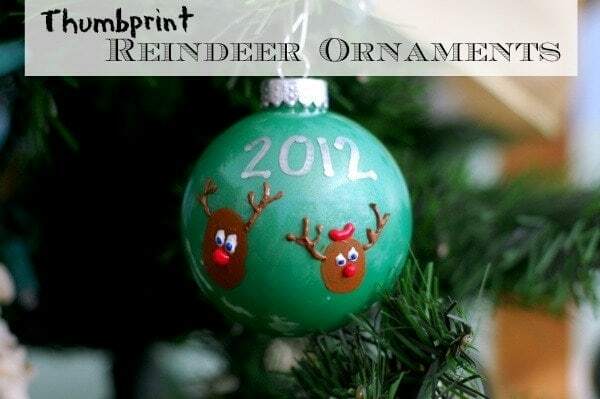 With that I was able to make an adorable thumbprint reindeer ornament for each child in his class that was personalized for each individual with their name and the year. 1. Take the top of the ornaments off and place them in a safe spot. 2. Drop a generous amount of paint into the ornament. Don’t worry, if you need more you can always add more. 4. Perfect! Once the ornament is completely coated on the inside it’s time to dry! 4a. Set the ornament upside down on a paper towel and let dry overnight. A bit of excess paint will be leaking out. Don’t worry about that. Simply collect it back up into the bottle and use in the future. 5. Once the ornaments are completely dried it’s time for the fun part! Grab your kid, the brown paint and a brush. 5a. Paint a thin layer of brown paint onto your child’s thumb. 6. Place your child’s thumb on the ornament and be careful not to move while doing so. These ornaments are slippery. But don’t worry! If your thumbprint does get smeared, simply grab a wet towel and wipe off to start again. 7. After allowing the thumbprint to dry completely it’s time to create our reindeer! Using the brown puffy paint add a few antlers to the sides of the print. Then taking the other colors create the face of your reindeer. We personalized the eye color for each child. Let dry completely. 8. Add the year and your children’s names if you wish with the metallic pen, grab a piece of ribbon or an ornament hook and add your ornament to the tree! Or wrap it up to give to Grandma and Grandpa. Making gifts for friends and family is a great way to show how much you care for them without spending a lot of money out-of-pocket. And with these types of gifts, the recipient will think of your child every time they add their ornament to their tree. What holiday ornaments or crafts are you making this year? What a cute and simple looking holiday craft! I am loving these! Will have to share with my kids!